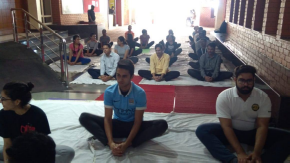 On the occasion of International Day of Yoga 21st November 2018, Symbioisis celebrated the International Yoga Day for the betterment of the society, ultimately to help in building the prosperous & mindful nation. 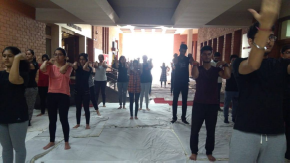 Teaching & non-teaching staff & students of Symbiosis Centre for Management Studies, Pune participated in large numbers to celebrate the International yoga day at Symbiosis viman nagar campus. 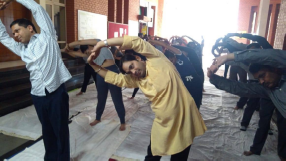 The session was comprised with the few asanas of Yoga which can be performed comfortably by all. 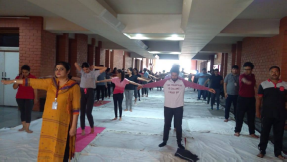 The session was carried out under the guidance of well-trained Yoga trainers Ms Priyanka, Mr Sunil & Mr Jagdish. The event was a grand success & all the participants were very pleased & looking energetic after the session. Below are few photos of the session.